Yuehe Lin was elected to the Washington State Academy of Sciences. 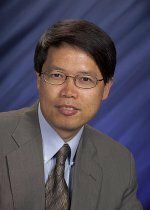 Yuehe Lin at the Department of Energy's Pacific Northwest National Laboratory has been elected a member of the Washington State Academy of Sciences. He will join an elite group of scientists and engineers from across the state for their outstanding scientific and technical achievements. Academy members provide their leadership and expertise to help solve issues affecting Washington State, inform public policy-making, and increase the role and visibility of science among the public. The academy was created in 2005 and, including the class of 2018, consists of 286 members from various academic disciplines and backgrounds. The three new inductees bring PNNL's total number of staff who are members to 22. Lin is a PNNL Laboratory Fellow who holds a joint appointment between PNNL and Washington State University where he is a professor in the School of Mechanical and Materials Engineering. He was recognized for his role "in the development of new nanobioelectronic devices and nanomaterials for biomedical diagnosis and drug delivery." He is a fellow of the American Institute for Medical and Biological Engineering, the Royal Society of Chemistry, and the American Association for the Advancement of Science. Several PNNL researchers hold leadership positions in WSAS serving on the executive committee, board of directors and topical working groups. Don Baer, a PNNL Laboratory Fellow serves as the organization's secretary. Jud Virden, PNNL's associate laboratory director for energy and environment is a board member. Sue Clark, a Battelle Fellow, who holds a joint appointment at PNNL and Washington State University, is serving a second term on the board. The 29 new WSAS members elected this year will be inducted at the academy's 11th annual meeting at the Seattle Museum of Flight on September 13.